It seems that the beautiful and famous daughter of Rome (Florence) likes bling. Not in the Kardashian style but more like that of a true Renaissance princess with a Medici father who felt that shopkeepers who inhabited the Old Bridge below his secret corridor were a motley crew with habits not befitting a Grand Duke. So in 1565 Cosimo de’ Medici ordered the closure of the smelly butchers’ shops then on the PonteVecchio (Old Bridge) and arranged for the shops to be taken over by several gold merchants. Now Cosimo’s private passageway across the Arno from his palazzo (Pitti Palace) to his offices (now the Uffizi Gallery) could be more pleasant and secure. Today the Ponte Vecchio is a landmark of Florence and the jewelry shops that line the bridge are world famous. 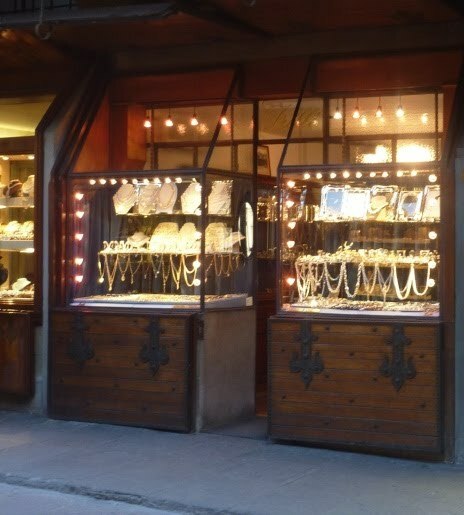 A Renaissance marketplace with hand crafted gold necklaces, bracelets, earrings and rings, cameos, pearls and precious stones displayed in an evocative setting make a walk along the Ponte Vecchio across the Arno River a must do when in Florence where you can almost hear the footsteps of the Medici on the elevated walkway that separated them from the rest of the world. Italian food is one of the most popular foods in the world. It is also one of the most misunderstood; in some cases commercialized beyond the point of recognition. Centuries of culinary traditions define Italian cooking yet Italian food often becomes a pale interpretation of what it means to eat like an Italian. Here are 5 tips to bring Italy home and help your kids appreciate the true flavors of Italy. In Italy pizza doesn’t include everything but the kitchen sink meaning that a traditional Italian pizza has a thinner crust and fewer toppings. 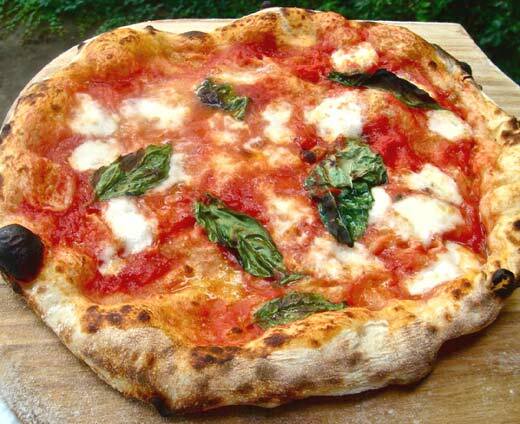 In fact the classic Margherita pizza only has three ingredients spread across the dough like a banner in honor of the Italian flag; tomato (red), basil(green) and buffalo mozzarella (white). All healthy, low in fat and so satisfying that your kids might not miss the sausage and pepperoni as much as they think. Filled pasta is very common in Italy. Vegetables, meat, fish, cheese, and salumi (cured meat) are used alone or in various combinations to create pasta ripieno (stuffed or filled pasta) both savory and sweet. Tortellini, tortelli, agnolotti, cappelletti and cappellacci are a few of the many regional variations as well as ravioli, Chef Boyardee’s contribution to the Americanization of Italian food for kids. Chef Boyardee’s ravioli were inspired by Italy’s ravioli col ragu’ (ravioli in a tomato and meat sauce) but the diversity of regional Italian food traditions also pair filled pasta with lighter sauces made with butter and herbs often without tomato. Although Italians do fry filled pasta, mainly in the form of a filled pastry or fritter (the word tortelli is dervied from the Italian word torta meaning cake, pie or tart), fried ravioli dipped in marinara as an appetizer or finger food is not usually seen. Introduce your kids to an authentic Italian antipasto. Start the meal with an affettati misti, a platter of traditional Italian cold cuts (mortadella, pancetta, prosciutto, salame), pickled or fresh vegetables, olives maybe some cheese and skip the fryer. Pasta in Italy is not drowning in sauce. In Italy sauce is used as a seasoning or condiment to enhance the flavor of the pasta rather than overwhelm it. In Italy just enough sauce is added to coat the pasta (a scant ¼ cup per portion) with a spoonful on top so you can see the beauty of the sauce. So don’t put too much sauce on your pasta. An excessive amount of sauce is just wrong because it will mask the flavor of the pasta and that would be a pity. Filled pasta can also be served al brodo in a vegetable, chicken or beef broth for a satisying one dish meal. Do you remember when your mother made a simple sandwich with two slices of soft white bread with the crusts removed? They still do that in Italy. It’s called a tramezzino. Not all Italian sandwiches are made grinder style filled with so much meat, cheese, fillings and sauce that it could literally sink to the bottom of your stomach (maybe that’s why they call it a submarine sandwich). The original “Italian style” sandwich (aka sub, hoagie, torpedo, grinder) was born out of American necessity and ingenuity in the late 19th early 20th century. Various stories attribute its origin to New England dockworkers, Navy servicemen or destitute hobos. 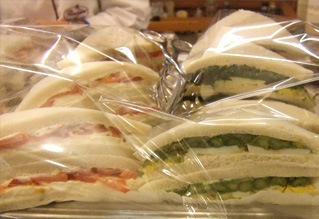 In Italy a panino is a “small” bread roll made into a sandwich with various fillings. Tramezzini are made with sliced bread and are a popular and inexpensive snack sandwich perfect for kids and as a light bar food for adults. Panini and tramezzini bring the flavors of Italy home with the “less is more” and “it’s all about the ingredients” philosophy for an authentic taste of Italy. Parmigiano Reggiano is the “undisputed king of cheeses” made according to a process that has not changed in 700-800 years. Under Italian law real Parmigiano Reggiano cheese can only be made within a certain region of Italy (the cities of Parma, Reggio-Emilia, Modena, Bologna and Mantua) and the name Parmigiano Reggiano is classified as a PDO (protected designation of origin) product of Italy. High in amino acids, calcium and phosphorous Parmigiano cracks, crumbles, flakes, shaves and grates easily; something you won’t see the cheese in the green can do. 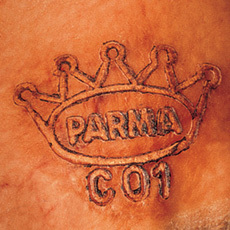 Look for the inscription ‘Parmigiano – Reggiano’ impressed along the side of the whole cheese to identify it as real. Parmesan (the cheese in the green can) is an Americanization of the word Parmigiano. In Italy Parmigiano Reggiano is aged for a minimum of 18 months to as long as four years. The standard US curing time for Parmesan cheese is 6-10 months. 60% of the world’s most important works of art are in Italy and almost half of those are in Florence. Enter the Duomo of Florence (Santa Maria del Fiore), one of the most famous cathedrals in the world and the location for one of the world’s most impressive works of art. In the shadow of Brunelleschi’s Dome, the Bronze Doors of the Baptistery of the Cathedral of Florence are as iconic as the Dome or the statue of David. Here you will literally come face-to-face with one of the movers and shakers of the Italian Renaissance. Gates of Paradise. It was here that I met Ghiberti by way of a gilded bronze relief of the artist’s image. In the distant past it was a common belief that East of Asia Eden could be found. Countless merchant ships relentlessly searched for a place, a compass point, a tangible position on a map where Paradise lost could be rediscovered. The biblical location of Eden may have pointed to the East but the gastronomic location of the garden of earthly delights most certainly was to the West. If Eden had a taste it would be Italy. For no country is more perfectly constructed for the enjoyment of food and wine to the benefit of man than l’italia. The 16th century Italian writer, Teofilo Folengo wrote of a country with “rivers full of soup which ran together into a lake and a sea of stew in which plying to and fro were thousands of boats made of pastry with shores of tender fresh butter and on them hundreds of saucepans smoking to the clouds with ravioli, macaroni and other delights”. Although these imaginative accounts of the culinary landscape of Italy are part of the diversional storytelling of a Renaissance poet, the foods you will taste while traveling in Italy are truly gastronomic wonders. Traveling in Italy without taking the time to understand the traditions behind regional Italian cuisine will only allow you to experience Italy on the most superficial of levels. Most Americans think they know what Italian food tastes like, but without knowing the background, traditions and ingredients necessary to be authentic they don’t. Make the most of your travels in Italy. They may be as close to Eden as you can get on earth. Ligurian pesto is considered by many to be the best in all of Italy The temperate Mediterranean climate along the Ligurian Sea produces a classic Genovese basil (Ocimum basilicum ‘Genovese’) prized for its fragrant aroma and spiciness. The evocative flavor of an authentic well prepared Ligurian basil pesto screams Italy and makes a perfect ingredient to pair with pasta. In this case, thin sheets of lasagna pasta dough smeared with basil pesto and finished with a bubbly bechamel sauce. I learned to make this recipe from Enzo Malvicini. He was not a chef but the owner of harness race horses who had come to America to race at Balmoral Park in the late 1960’s. Enzo was a friend of our Nonna. He lived in Milan and when he wasn’t at the track he would come by to visit Nonna and to cook. Even the most infrequent of cooks in Italy can make a restaurant quality meal from scratch. This is the first time I had bechamel (besciamella) sauce rather than bolognese for lasagna. 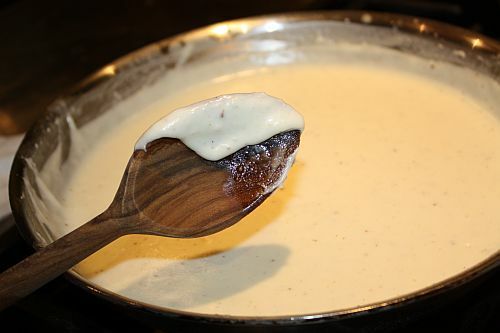 Although bechamel is thought to be French in origin, this refined sauce is said to have been brought to France by Caterina de Medici. When she became the Queen of France she bestowed on the sauce the name of one of her courtiers, the Marquis Louis de Béchameil. Watch aristocratic chef Lorenza de Medici make bechamel . Then pair this mild creamy sauce with pesto for a summertime lasagna that will have your friends wondering at what Italian cooking school you’ve been studying. Butter an 8×8 high rimmed pan and lay a single layer of parboiled lasagna noodles to cover the bottom of the pan, barely overlapping. Spread 3-4 tablespoons of pesto evenly over noodles. Cover with a thin layer of bechamel, a few pads of butter and a handful of grated Parmigiano Reggiano cheese.Repeat the layers until you reach the top of the pan. On top finish with a generous layer of bechamel only, a few pads of butter and the rest of the cheese. Wrap tightly with a non-stick foil. Bake for one hour . Remove foil and bake for an additional 10 minutes more, until top is golden. Remove from oven and let stand for 15 minutes before slicing. We’re big fans of anyone who wants to see and savor the world. So when we heard about 36 y/o Italian Maximilian Felici ‘s desire to accomplish what the legendary Phileas Fogg did in 80 days we wanted to follow. 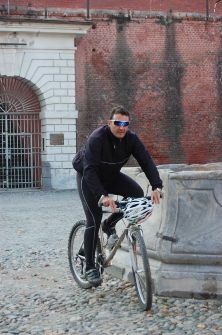 . . on his bike. Expected time for this trip is about 4 years, for a total of about 108,000 km across 67 states and 5 continents. Italian coffee producer Mokasirs will keep fans updated on details of Maximilian’s trip with exclusive publishing of his reports. Among the equipment that he’ll have is a laptop, a camera, a transponder and a satellite receiver that lets you follow his movements in real time on a map. The Italian pig is revered. One of Italy’s most famous salumi comes in the form of cured hams known as prosciutto crudo. The celebrated hams of San Daniele, Parma and Toscana are so valued for their flavor, aroma and methods of preparation that they are given DOP aka PDO (Protected Designation of Origin) certification, the Italian government’s seal of approval that they are a product of a food tradition that can occur nowhere else. DOP certification sets out strict rules regarding the genetic make-up and breeding of pigs that will be wearing the ducal crown (the trademark of Prosciutto di Parma) or those whose hams are elegantly shaped like a Stradivarian violin (Prosciutto di San Daniele). Porchetta, a suckling pig rolled up and spit roasted (girarosto) over a wood fire with salt, pepper, garlic and wild fennel has a gastronomic reputation that goes back to the time of the ancient Etruscans. Just about every sagra or street fair in Italy will have a porchetta on the spit with a line of Italians strung out waiting for packets of sliced pork (maiale) to eat on the spot or take home. Signor Pig is treated very well in Italy. He was always respected as a symbol of plenty. 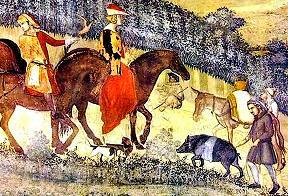 The Cinta Senese or Sienese Belt Pig (named for a white belt around their chest) is pictured in a famous fresco by Ambrogio Lorenzentti (1338) in Siena’s Palazzo Comunale (town hall) titled L’Allegoria del Buon Governo (the good/wise government). In the contra fresco il cattivo governo (the bad government), the pigs are missing and in the quarries of Michelangelo the cured lard of Colonnata (Lardo di Colonnata), with the intoxicating flavor of aromatic spices and herbs is an artisanal delicacy thinly sliced and served over warm Tuscan bread that can be described as nothing less than inscensual. So when you’re seeing a savoring Italy make sure to arrange an introduction to Signore Pig at the local trattorie. He’s dressed in many ways (sausage, salami, prosciutto, arista di maiale) and although he may be called Stinco in Bolzano he is most congenial and not to be missed. Farm to table cooking where the food on the table comes directly from a specific farm is certainly the best way to eat. For many people locally sourced, seasonal food with a direct link to the producer is the ultimate form of consumer confidence with a capital G (greener). Italians have always realized the importance of freshness and quality of ingredients with over 50,000 farms in Italy committed to growing produce by natural methods. Italians truly value food. It begins with the growing of the food, the selling of the food at the market and extends to the careful and considerate preparation of the food that is brought to the table. But as in most countries buying direct from the farm to table isn’t always possible. Enter Italian Mario Pianesi, founder of Un Punto Macrobiotico (UPM) an association dedicated to a macrobiotic way of living. For those who cannot source farm direct, Pianesi has proposed an alternative way for consumers to know the intimate details of where their food comes from. 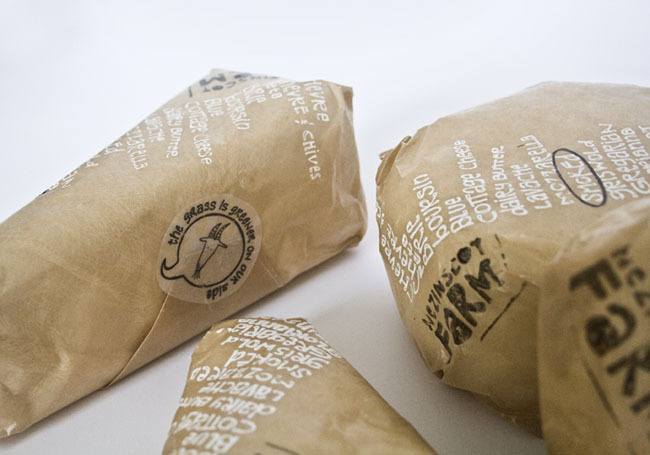 It’s called transparent labeling with information on the “entire food chain from farm to shop shelf”. Full and open disclosure is given including the location of the farm that grows the food, the area and amount harvested, the year of the harvest, the number of people employed, and the specifics of the farming method, such as the origin of the seed, how the sowing is done, what kind (if any) of organic fertilizer is used, amount of energy used, amount of water and irrigation used, weed control and details of processing. Pianesi is now trying to get his labeling system approved by the Italian government. Food transparency whether on principle, politics or pragmatism translates into a greater awareness of what we eat and that translates into a healthy satisfaction and appreciation of the land and hands that feeds us. *More than a hundred UPM macrobiotic centers are located throughout Italy including restaurants, shops and production centers for natural clothing, décor and footwear where Pianesi’s philosophy of the macrobiotic lifestyle, diet and “polyculture” agricultural methods are promoted. This week I’m seeing and savoring Italy along the southwestern shore of Lake Michigan. Michigan is about an hour drive from where I live and I’ve spent many summers at Michigan beaches and winters on x-country ski trails. But it wasn’t until I started traveling in Italy that I realized Michigan and Italy have a lot in common. Like Italy Michigan is a peninsula. The northern most region of Michigan is at the 45th parallel – the same as Chianti in Tuscany and although nothing can compare to the vineyards of Italy, the European grape varieties common to Italy happily grow along the shores of Lake Michigan, where the “lake effect” moderates the temperatures. Michigan like Italy is known for its seasonal produce and farm to table menus and shares Italy’s passion for cultivation and processing techniques inherited from tradition. At the Frederick Meijer Gardens and Sculpture Park in Grand Rapids there’s another Italian-Michigan connection that goes back to the time of the Renaissance. In the 15th century, Leonardo da Vinci designed a monumental horse to be cast in bronze. Leonardo da Vinci’s horse, the Gran Cavallo, was intended to be the largest equestrian statue in the world, Commissioned in1492 by Ludovico Sforza, the Duke of Milan, it was never realized. The clay model was destroyed by French soldiers when they invaded Milan in 1499. A 1967 discovery of da Vinci’s sketchbooks with designs for the 24 foot horse inspired Charles Dent, a retired United Airlines pilot and art collector to organize a nonprofit group to ressurrect the horse. 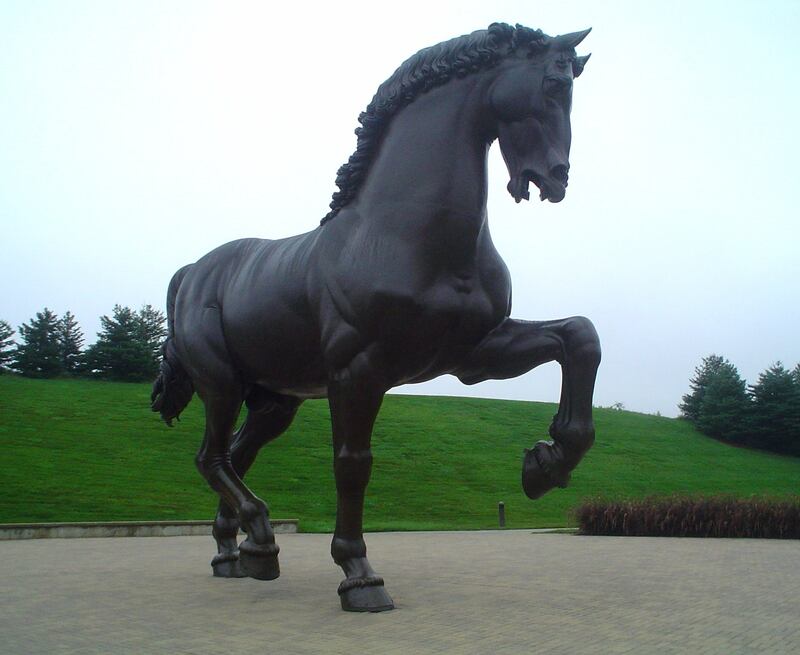 With the financial backing and support of supermarket magnate Frederick Meijer, Nina Akamu an American-born sculptor trained in Italy, created “The American Horse”. Based on Leonardo’s designs, Akamu casted two copies, one for the city of Milan and the other for Meijer Gardens in Grand Rapids, Michigan. Additional renderings The Horse of different sizes can be seen at the San Siro Hippodrome Cultural Park in Milan and Leonardo’s birthplace Vinci in Italy and in Allentown, PA, Dent’s hometown. There are other wonderful sculptures among the Frederick Meijer Gardens including works by Dale Chihuly who did a remarkable installation over the canals of Venice, Italian artist Mimmo Paladino and Beverly Pepper (Galileo’s Wedge) an American artist living between New York and Todi, in Italy. Italian cities and towns can be hot in the summer. AC is not standard in most Italian homes. Central air conditioning as we know it is rare although many tourist hotels in the larger cities do have accommodations with air. However because of the intricacies of Italian law and the high cost of energy there may be some restrictions for usage. Architectural regulations for historic buildings often prohibit alterations for air conditioning making it difficult to retro-fit. Ancient villas and farmhouses were constructed to beat the heat with thick stone walls, overhangs and external shutters. Italians may complain about the weather but without the luxury of air conditioning they’ve learned to keep their cool and not sweat the small stuff. They accept the summer heat in typical che sara’ sara’ style knowing that it’s part of a seasonal cycle. The best way to cope during the summer is to do as the Italians do. Begin your day early, wear clothes made of lightweight, breathable materials (cotton or linen). Keep the shades or curtains in your home closed, stay out of the mid-day sun and re-emerge in the evening for a stroll and light dinner. Leave the cities during the month of August (notoriously hot in Italy) and travel to the seashore or mountains. Many Italians traditionally take off the month of August (Ferragosto) and many shops and offices in Italy are closed. US tolerance for the temperature seems to have lessened over the years as our parents and grandparents remind us that mass- produced window air conditioning units in the United States only became available in 1947. In 1969 only 54% of all new US cars had air conditioning and new homes had just begun to be built with central air conditioning. Summer in the city can be uncomfortable but once again Italians have mastered the summer heat with typical Italian sprezzatura. So enjoy a spritz, sorbetto, granita or gelato. Eat cold salads (my favorite is panzanella) and most of all be fashionably cool!